For those who prefer to be driven and are well organized, bus companies offer a great alternative to car, train or even planes in New Zealand. Travelling by bus has big advantages like giving you time to admire the scenery and relax. Choose your company well and you may be in for an unforgettable journey. Regional and national coach and bus companies operate frequent daily services to most towns and cities in both the North Island and South Island. Some companies even offer services connecting with ferries operating between Wellington in the North Island and Picton in the South Island. A simple transportation method, getting from point A to point B while saving money compared to flying. A great way to discover the country with likeminded people at your own pace. Get a pass (usually valid for a year) and jump on board, local drivers stop at great spots on the way and organize activities for you. How does hop-on hop-off works? All of these companies offer online booking or can be booked around the country in different offices. Be aware that most advertised prices usually require early booking. We also like to have a look at the services offered on the bus, for example, a couple of dollars more you can have free WiFi on the bus, so it’s worth asking. Most of the buses are modern, eco-friendly and air conditioned, with some national coach services having a washroom/toilet onboard. All regional and long-distance bus and coach services do stop regularly for refreshments and comfort breaks. What is the best bus network in New Zealand? 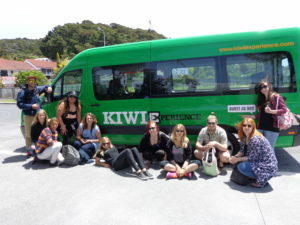 The national bus travel networks of Stray and Kiwi Experience operate frequent services covering every major town, city, ski field, attraction and destination throughout New Zealand all year round. Both bus companies are award winning hop-on hop-off bus networks for adventurous travellers. They actively seek out the best stops and attractions so you’ll get the best experiences the real New Zealand has to offer. The hop-on hop-off network is not just about going from A to B. You get a whole experience: meeting like-minded travellers, learning about New Zealand from your driver guide, and stopping off along the way to do walks and activities you might have not known about. Not only do you get to visit the places you’ve read about, but you are also taken to places you didn’t know about. This is your opportunity to see the real New Zealand. The flexibility of the hop-on hop-off bus means this trip is really up to you! You can hop off the bus anywhere along the route to do your WWOOFing, find work, or maybe you just really like a place and you don’t want to leave! Whatever it is, you can stay there until you choose one of the next scheduled buses to hop back on again. Now it makes sense: hop-on hop-off! Amazing! If you have limited time or just like going with the flow, you can stay on the same bus for the whole route. But with so much to do in some of the stops along the way, we would recommend hopping off the bus often.